What Day Of The Week Is October 13? 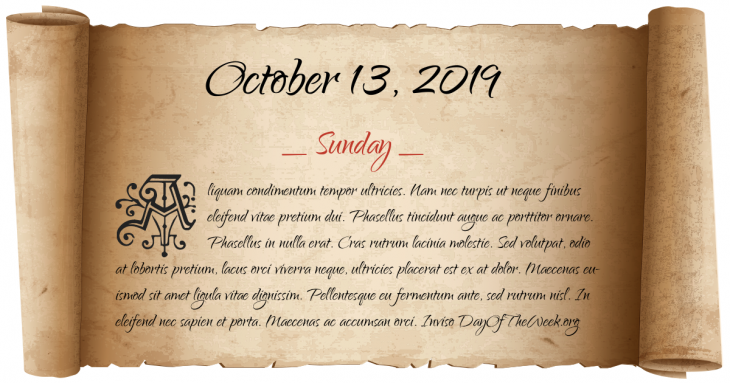 October 13, 2019 is the 286th day of the year 2019 in the Gregorian calendar. There are 79 days remaining until the end of the year. The day of the week is Sunday. Hundreds of Knights Templar in France are simultaneously arrested by agents of Phillip the Fair, to be later tortured into a “confession” of heresy. Rinchinbal Khan, Emperor Ningzong of Yuan becomes the Khagan of the Mongols and Emperor of the Yuan Dynasty, reigning for only 53 days. Revival of the Hebrew language as Eliezer Ben-Yehuda and friends agree to use Hebrew exclusively in their conversations. The Battle for the Hohenzollern Redoubt marks the end of the Battle of Loos in northern France, World War I. An Antonov An-124 operated by Antonov Airlines registered SSSR-82002, crashes near Kiev, Ukraine killing 8.
Who were born on October 13?